Along with being unattractive, cracked heels can be a source of pain and embarrassment. Educate clients on at-home maintenance that can heal and repair the skin. You: Are these cracks in your heels painful? Client: Yes, and I don’t know how they got so bad. My skin is so dry. Is it because I wear flip-flops all the time? You: Not necessarily. People who keep their feet covered still get cracked heels like this. Today I’m going to soak your feet, file off what I can, and then I’ll apply some moisturizer. But what really needs to happen is for you to do some at-home care. Client: What can I do? You: I have two retail products that will help. One is a daily treatment you would apply to your heels after you shower as you would a moisturizer. It will soften the skin and begin to heal those cracks over a number of weeks. The other is a treatment you use once. It’s a peel made of natural extracts that you let sit on your feet for an hour. You won’t notice anything for a few days, but within the week, all this dry skin will begin to shed. Some of my clients tell me they have to wear socks to bed because of the way it peels off. Once all the thick, cracked skin is removed, it will be easier to keep them healthy. Client: Which one of these do you think is better for me? You: To be honest, your heels got this bad partly because of neglect, so I would say start with the peel and then get into the habit of daily care. You should also come in for regular pedicures. We may need to do another peel in a few weeks. Client: OK. I guess it will be worth it if it helps my feet look better. You: It’s about more than just looking better. 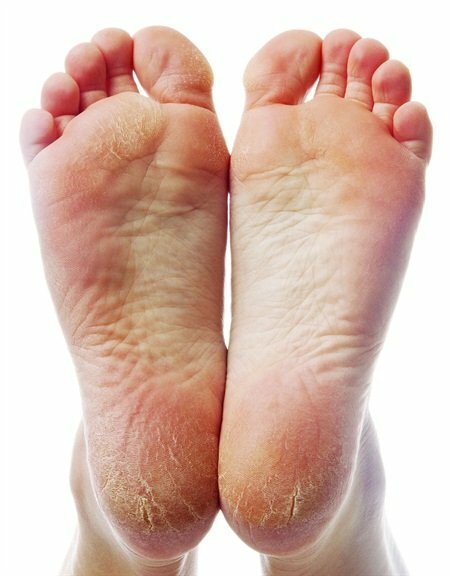 When your feet are healthy, there is less trauma on the foot, you will walk better, and it will improve your circulation. It’s particularly important for people with diabetes or at risk for diabetes. Remember, our skin is the largest organ in the body so when it’s compromised, we open ourselves up to the risk of infection and disease. Client: You’re right. I’ll purchase those products you recommended and set up another pedicure appointment for three weeks. Wondering what makes foot peels work? Most peels contain alpha hydroxy acids (sometimes called fruit acids), a group of natural acids found in foods. Alpha hydroxy acids work by removing the top layers of dead skin cells and moisturizing the healthy skin beneath.